Early in June 2017, two Assembly Bills (AB 151 and AB 378) failed to get past California’s Assembly. AB 378 was authored by Christina Garcia and two other Democrat Assembly members. It was supported by the California Environmental Justice Alliance and other members of California’s Environmental Justice movement. In an Assembly vote on 1 June 2017, AB 378 was rejected by AB-378 was rejected by 35 votes for to 39 votes against. AB 151 was also authored by Democrat Assembly members – Autumn Burke and Jim Cooper. It was far more industry-friendly than AB 378, and was supported by the Western States Petroleum Association and other industry groups. AB 151 has not been put to a vote in California’s Assembly. A third bill, SB 775, is also supported by Environmental Justice organisations. It was put forward by state Senator Bob Wieckowskiand state Senate President pro Tempore Kevin de León. The bill remains in the Senate. SB 775 proposes a new cap-and-trade scheme that would not allow carbon credits to be carried forward from the existing scheme. It would include no offsets, no free pollution allowances, and a per-capita dividend. Under SB 775 carbon credits would be auctioned off. There would be a floor price of US$20 per ton, and a price ceiling of US$30. The floor would rise by US$5 each year and the ceiling by US$10, plus inflation. Credits cannot be carried over from one quarter to the next, so firms cannot “bank” credits. By ruling out carbon offsets, SB 775 would also rule out the possibility of the oil industry and other polluters in California using REDD credits to continue polluting. Carbon traders, the oil industry, and “environmental” groups like EDF, opposed SB 775. Let me go back to the folks who are actually holding the allowances right now, as we speak. Our goal and our responsibility and our objective is to create jobs and put people to work and expand the middle class. That’s our job. Our job is not for those who are speculating on the market right now, who are trying to profit and buy low and sell high. That’s not our responsibility. Our responsibility is for economic growth, create jobs, expand the middle class, create the necessary technologies that will actually help us meet our 2030 targets, and reduce carbon and other harmful pollutants that our children breathe into their lungs. At the end of May 2017, Adam Gray and other business-friendly Democrats put forward their proposal for extending cap-and-trade beyond 2020. This, then, is the political environment in which Governor Brown has turned to his friends in the oil industry. In These Times reports that leaked documents show that “California’s fossil fuel industry is trying to write state climate policy to its liking”. The evidence is pretty overwhelming. And allowing the oil industry to be involved in writing climate policy is like asking the fox how big the holes in the fence around the chicken coup should be. A previous post on REDD-Monitor looks at Brown’s cosy links with the oil industry – the industry that California’s climate policy is supposed to be regulating. Rather than the government paying to clean up the air, it’s obviously better to stop corporations from polluting in the first place. By allowing companies to buy carbon credits, cap-and-trade allows pollution to continue. Regulations, not carbon pricing, have been the main driver of California’s carbon reductions to date. In fact, they have been so effective, and carbon reductions so much cheaper than expected, that there hasn’t been much work left for the cap-and-trade program to do. Near-term emission goals are being reached without its help. The logical way forward is to strengthen regulations and limit carbon trading. That’s more or less what SB 775 does. Even better would be abolishing carbon trading altogether, of course. Brown wanted a decision on extending California’s cap-and-trade scheme by the end of budget negotiations in June 2017. That didn’t happen, but the Los Angeles Times reports that Brown’s advisers hope to get a vote on extending cap-and-trade in early July 2017. California’s lawmakers leave for their summer recess on 21 July 2017. (1) Establish a price ceiling at $63 per metric tonne in 2021, increasing by 2 percent plus the consumer price index annually thereafter. The price ceiling shall ensure compliance can be achieved at a price no greater than the ceiling, and monies generated through compliance at the price ceiling shall be used by the state board to achieve emissions reductions that are real, permanent, quantifiable, verifiable, enforceable by the state board and in addition to any greenhouse gas emission reduction otherwise required by law or regulation, and any other greenhouse gas emission reduction that otherwise would occur. (2) Establish two price containment points at levels below the price ceiling. The state board shall offer to covered entities non-tradable allowances from the allowance price containment reserve for sale at these price containment points. (3) Establish a limit of no greater than 6 percent of a covered entity’s compliance obligation that may be met by surrendering offset credits. (4) Develop approaches to increase offset projects in California. (5) Set industry assistance factors for allowance allocation commencing in 2021 set at the levels applicable in the 2015-2017 compliance period. Apply a declining cap adjustment factor to the industry allocation equivalent to the overall statewide emissions declining cap. (6) In 2025, the state board shall assess changes in trade-exposure and the need to achieve greenhouse gas emission reduction targets and may revise the requirements established in sections (1), (3), and (5) above based on this assessment. The second draft proposal describes provisions to monitor air quality at selected location in California, including in disadvantaged communities, and at major pollutants such as oil refineries. It also includes a community plan programme aimed at reducing pollution, prioritising disadvantaged communities. The third draft proposal is probably the most egregious. 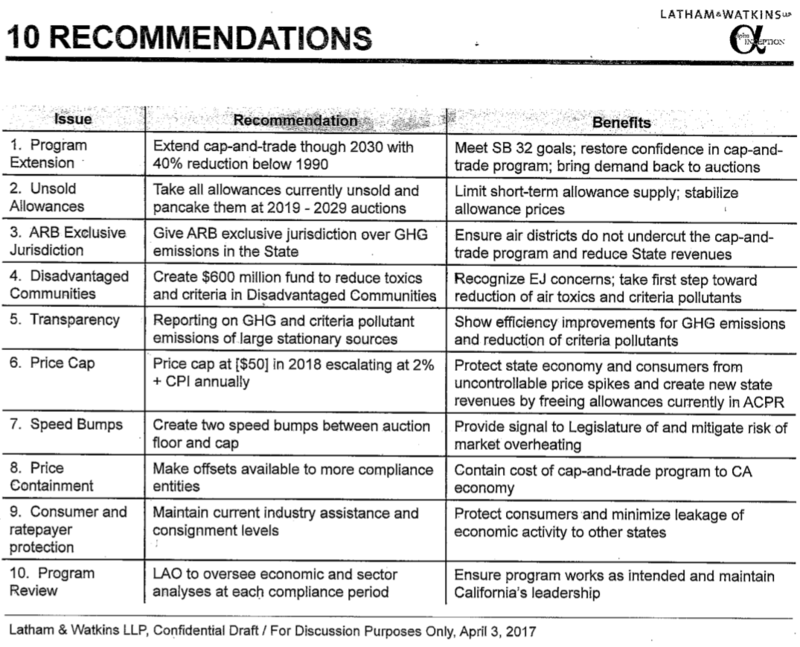 In its 2017 Climate Change Scoping Plan Update, the California Air Resources Board proposes reducing emissions from oil refineries by 20%: “Direct regulations would be promulgated to improve efficiencies across the sector”. The state board shall designate the market-based compliance mechanism … as the rule for petroleum refineries and oil and gas production facilities to achieve their greenhouse gas emissions reductions. Having weakened how emissions from refineries are regulated, the third draft proposal then prevents local districts from regulating emissions of greenhouse gases from polluting corporations if those corporations are subject to the carbon trading mechanism. The Brown Administration’s draft proposals clearly echo the Western States Petroleum Association’s requests for loopholes to be built into California’s climate legislation. RL Miller, Chair of the Environmental Caucus of the California Democratic Party, accuses Brown of “acting as the stenographer for Chevron”. Miller has set up a petition, with over 10,000 signatures, demanding that Brown stops taking his climate negotiating points from Chevron. Mightily impressive. What a long haul this is.